To prepare your board you need to make a masking tape drip edge to prevent the excess from ending up as drips on the underside of the board. 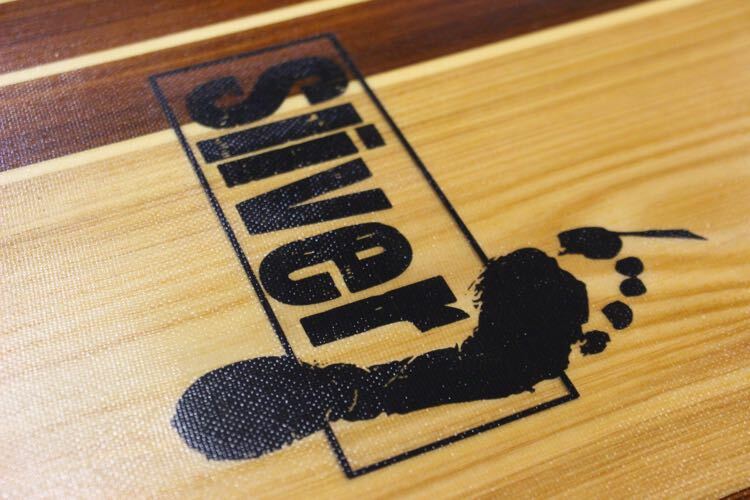 Start by laying your board on your glassing stands. 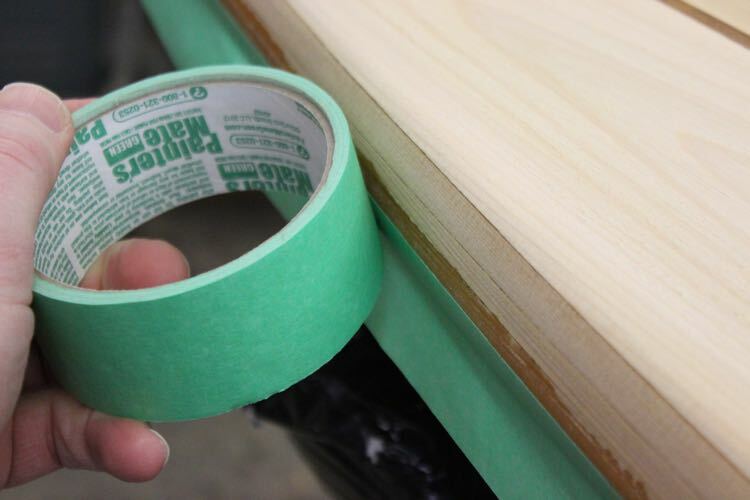 Using 1 ½ painter’s tape, run the tape around the perimeter just below the apex of the rail. I recommend not trying to go too far below the apex of the rails as the further you wrap the glass past the apex the less help you get from gravity. This transition you created with the tape will eventually be cut with a razor blade leaving you with a straight, clean lap-line. Lay your board on your glassing stands, double-checking that the board is sitting level from rail to rail. Make sure the fiberglass is relatively centered from rail to rail as you roll it out. Once the fiberglass is laying flat on your board, the glass needs to be trimmed so there is only about 2 inches hanging below the tape. The glass needs to wrap around the rail and hang enough that you are not picking up loose threads from the cut glass. You want the edge of the glass to be cut as clean as possible, as loose-hanging threads become a nuisance while laminating. A final step you need to take is to cut a “v” notch in the top layer of fiberglass if the nose or tail area has tight corners. (example: TEN6 has a diamond tail) Cured wrinkles and overlaps require you to do additional sanding so it is best to get them to lay flat. If you have printed out any logos or artwork that you’d like to place under the fiberglass, this should be done right before you are ready to laminate. To do this, carefully roll up all of your fiberglass layers to a point just beyond where you want to place your artwork. 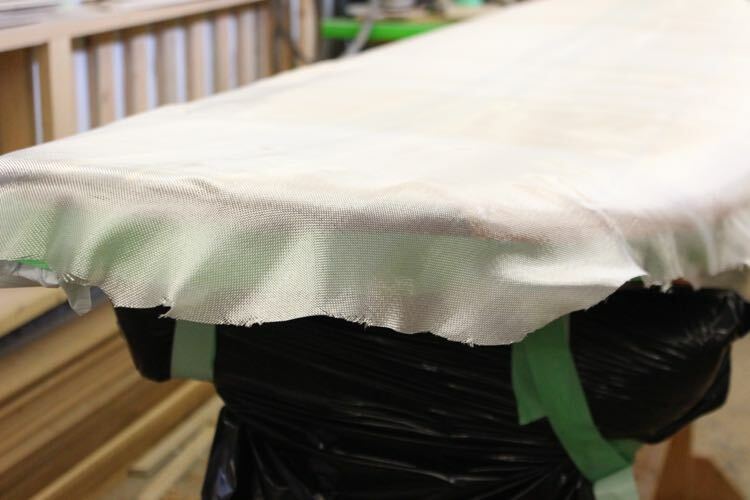 Try not to shift the placement of the fiberglass as you roll it up, as you will eventually be rolling it back down, and you want it in the same place. If the artwork is closer to the tail, roll up the glass from the tail. Vice-versa if the artwork is closer to the nose. You will be basting the logo to the woo with a thin layer of epoxy once your resin is mixed and ready to be spread on the fiberglass. 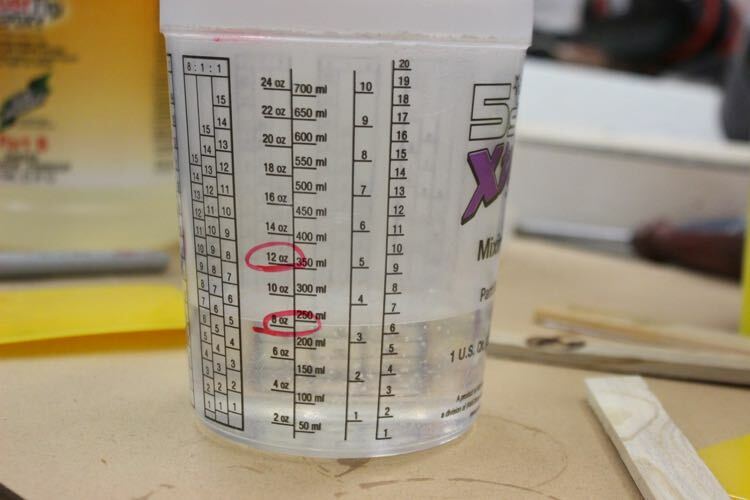 Start by pouring the epoxy from the cup down the ceterline of the board. The videos show a “professional” doing the whole board in one nice pour as he walks along. I prefer to do half the board at a time work from the mid-point to the nose and then pouring from the mid-point to the tail. Try to stop about 1 foot from the nose and tail or the resin will be on the floor by the time you get back to it. After the initial pouring of the epoxy the goal is to work the resin from nose-to-tail in one even stoke to properly tension the glass. Low the resin from the centerline towards the rails. As you work your way with the spreader toward the rails, your next step is to saturate the laps (the fiberglass that is hanging over the rails) and wrap them around the rails. To saturate the laps, use your spreader to “waterfall” the epoxy over the side of the rails. Try to saturate the rails evenly or the wood can end up with a tiger strip effect if resin is thicker in some spots than others. Try to catch the resin in your bucket so you can re-use it to complete the rail-saturation. It is important to be wearing gloves, because this is where things start to get messy. You need to saturate all of the glass on the rails, so use your gloved hand if needed. If you find yourself running short on resin, use your spreader to work from the stringer (but no further than the stringer) toward the rail with harder pressure and a vertical angle with the resin spreader. There will probably be excess resin pooling in the center of the board that you can plow over toward the rails to help saturate the laps. This resin will collect on your spreader, and you can just rub it off your spreader on to the dry areas of the laps. Once the laps are substantially saturated, it’s time to tuck them under the apex of the rail so they adhere well. Always start in the middle of the board when you are tucking laps. Work your way toward the nose and when you finish, go back to the middle and work your way toward the tail, being careful not to create wrinkles as you are tucking the laps under. If you cut your v-notches in the nose and tail, you shouldn’t have a problem with wrinkles. Another thing to watch for while tucking the laps is hanging “strings” of saturated fiberglass. If there are any hanging strings, take your resin spreader and gently retrieve them. Be careful not to pull the strings too hard and pull a section of glass off the board. If this happens just squeegee it back down. If you did a good job saturating the laps, they should stick well to the rail. Get down low and double check that the adhesion is good, and that there are no unsaturated areas of glass. You should spend 10 minutes or so making sure the laps are well saturated, adhered well, and free of wrinkles. You also need to try to eliminate any air bubbles that may form in the lap area. This is prone to happen along the sharp edge along nose and tail, so take extra care to squeeze out these bubbles with your spreader or finger. Finally, take a good look at the entire lamination and check for any pooling of resin, dry spots, or air bubbles on the flats and especially the rails and nose/tail areas. The nice thing about epoxy is that it hardens gradually and can be moved around even as it cures. If you have knots are absorbing all the resin add a drop of resin even if it will leave a pimple. It is easier to sand a high spot than deal with dry weave that needs to be removed. 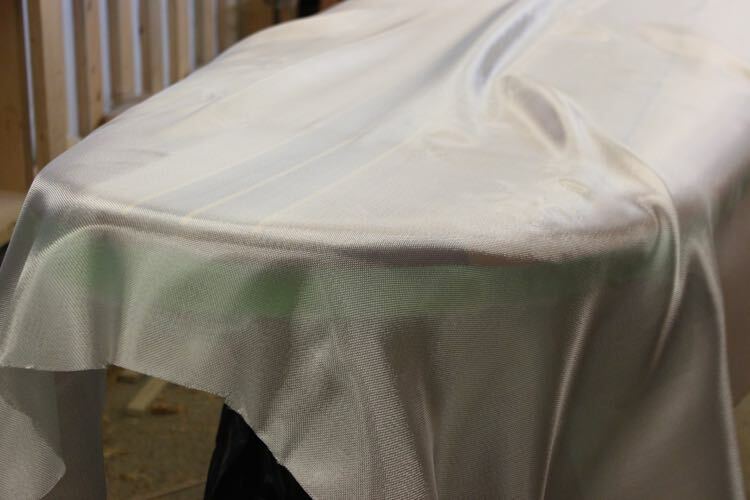 Fibreglass usually only goes clear the first time it is exposed to resin. Once you are satisfied with the lamination, leave the board alone, and do some clean up. While it is still wet, Epoxy can be cleaned off of most things (skin, mixing sticks, spreaders, and scissors) with citrus-based soap (Gojo) and water. 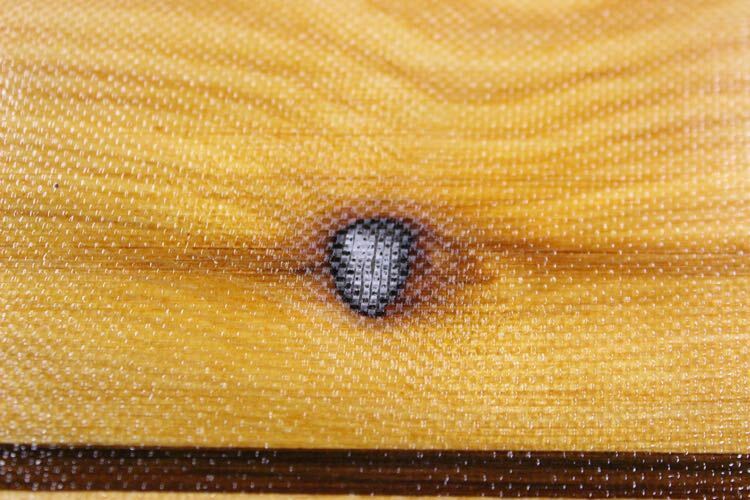 Epoxy really likes to cure without a large fluctuation in temperature, so if you are glassing in a garage, it’s a good idea to time your lamination for a period where the outside temperatures won’t change much during the 1-2 hour cure period. If this isn’t possible, you can carefully carry your board inside and allow it to cure in a controlled environment. I usually leave the board to cure overnight and glass the other side the next day. 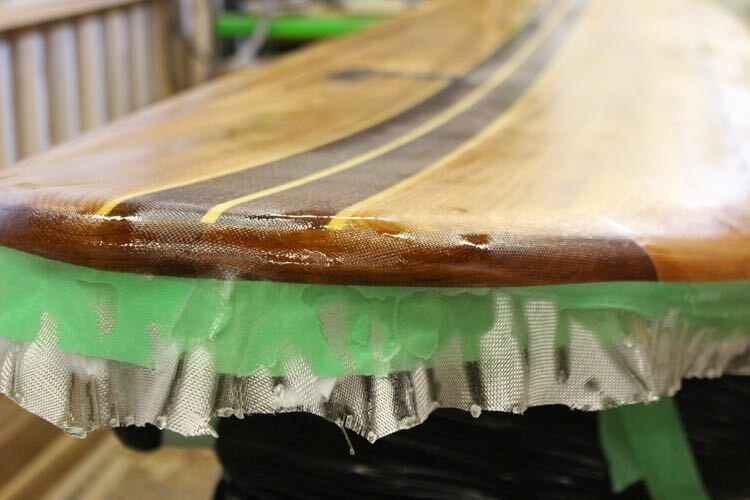 Entropy Resin has done a great video tutorial on wood surfboard laminating. Lay your tape perimeter in the same fashion as you did on the bottom. I usually overlap my two seams resulting in 2 layers of glass at the apex of the rail. This probably isn’t required if you cut a perfectly straight lap line but it makes practical sense to reinforce the area that will take the most abuse. You are now placing the tape over a cured lamination, which will be a little bumpy, so make sure you push the tape down well to avoid bleeding of resin under the tapeline. Once your bottom lap-line is taped and masked off, you follow the exact same procedure for laminating the deck as you did for laminating the bottom.